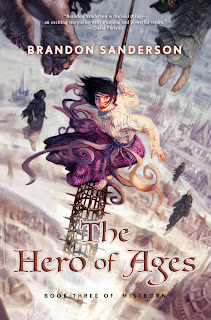 Brandon Sanderson did it again - not a disappointing end to the Mistborn Trilogy at all, and it's been the most exciting fantasy series I've come across since Harry Potter and Twilight. I'm usually pretty good at anticipating things, enough that a lot of stories seem predictable to me. I had lots of theories and predictions about this book, how it would wrap up the series, and they were, without exception, wrong! Which I think was awesome. The only author I've discovered who compares in his/her ability to interlink plot details, have unexpected twists, etc. is J.K.Rowling, and I can't give Sanderson much higher praise than that. Some of the things that happened gave me big AHA moments that were lots of fun. As with the other books, the action is awesome. Allomancy is cool, and the battle sequences are awesome. You learn too about more about Ferrochemists and also about Hemalurgy, which is all unique to these books. Some of the details get a little macabre, so probably still PG-13. I also love the characters in these books. They seem so real to me, with well developed personalities, and also with personal struggles and developments. This book especially shows Sazed and Elend as they deal with things that test their metal (haha - metal - ok so not funny unless you've read the books). As with the other books, the setting, subject matter, and way things are handled is original and amazing. Pretty much the only other thing I can think to say without spoiling anything is that you won't be left with much of anything unresolved in this one - only enough for Sanderson to someday write sequels, but they aren't needed to wrap up the series. Top marks again for this one. Way to go, Brandon Sanderson, and thanks to Paul and Danny for recommending this series to me!